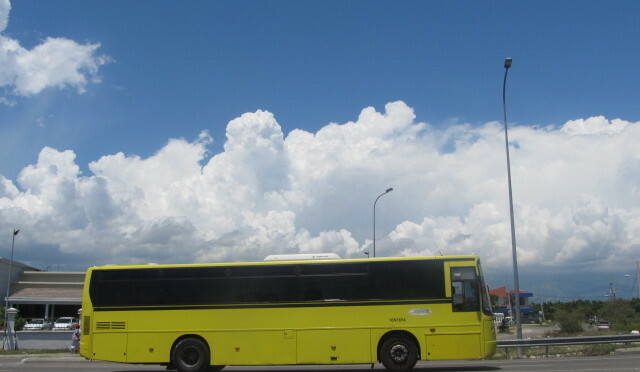 Airports across the world usually have a shuttle/ bus service which is a cheaper option to airport cabs which are costly. I get numerous emails from travelers about transportation or the cheapest way to get around in Jamaica because there is little information online. Though Jamaica is recognized as a tourist country , people in the industry sometimes fail to recognize that not all travelers are the same. Not everyone wants to or can afford to be chauffeured around or to take tours. Yes, hiring a driver to get around is comfortable and convenient so if you can afford it by all means go ahead but if not keep reading. There are two international airport in Jamaica , Norman Manley International in Kingston and Sangster’s International in Montego Bay. If you ask at the information desk for ground transportation it is highly likely that you will be referred to a taxi outside or to the car rental area. It is rare that a foreigner will be told about public transportation, in fact you may even be told that there is only one way to get where you want to go and this is why. 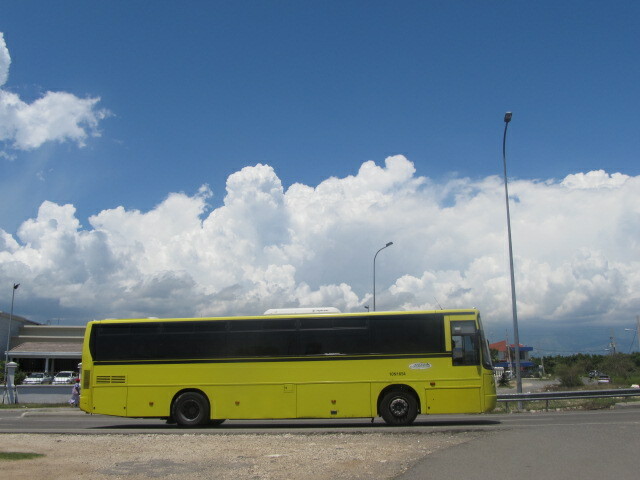 1) For Jamaicans, it is unusual for tourists to take the bus. I have had friends from abroad who were directed to a cab each time they waited in line for the bus. The average Jamaican doesn’t understand why someone from overseas would choose to take public transport when they have the option to hire a taxi. 2) Public Transportation is viewed as unsafe for foreigners. As a foreigner especially if Caucasian , you will stand out when taking public passenger vehicles. The risk of being pick-pocketed does exist but thousands of Jamaicans commute on public transport daily and face the same risk.Theft can occur on public transport in any country so so it is up to the individual to take the necessary precaution, be alert but not paranoid. 3) It is the slowest way to commute and there isn’t a reliable schedule. If you are in a hurry to get to your destination then you may regret taking public transport as it is hard to plan arrival and departure time. 4) It is not the most comfortable mode of travel. Buses from the airport tend to be comfortable and air conditioned but you will encounter crowded buses where you have to stand or experience six people being squeezed in a space that is meant for four or less. Now you know why you are advised against public transport , if you are not deterred then then you may find the following information useful. Both Airports are serviced by the Jamaica Union of Travelers Association (JUTA) . Upon exiting the airports you will see drivers offering to assist you. In Montego Bay JUTA has a minimum fee of US$10 for round town transfers. If arriving at nights this is the safest and only option unless you made prior arrangements with your place of accommodation for pickup. Expect to spend between US$20-40 for a cab if staying in Montego Bay and US$75 or more for outside. JUTA Taxis are always readily available at the Norman Manley International Airport. Prepare to spend between US$30 and $50 to get to your accommodation in Kingston and US$100 and more for anywhere outside of the city. Alternative- The Jamaica Urban Transit Company (JUTC) , a state owned company operates a daily bus service throughout the Kingston Metropolitan area which even extends to the adjoining parishes of St. Catherine and St. Thomas. The number 98 bus runs from Downtown Kingston to the airport and Port Royal. The cost is JA$100 (less than US$1) per stage to get around the city. On average there is a bus every 45 minutes but service is slower on weekends and holidays. You can take the bus to the end of the route in downtown Kingston then take the #500 bus to Half Way Tree Transport Center. Half Way Tree is considered the city centre and it houses a transportation hub with buses that connect to all parts of the city. All the major hotels in Kingston are located in New Kingston , so from the Transport Center you can get a bus to New Kingston or get information on the best way to arrive at your destination. The bus runs up to 10pm but I would not advise foreigners to take the bus after 6pm as it is more difficult to maneuver your way around a strange country at night. If spending a few days in Kingston , you will get to know Half Way Tree quite well as this is where you would often connect to access buses to various city sites like Devon House, The Bob Marley Museum, Hope Gardens and Papine if you intend to go to the Blue Mountains. 1) Always have Jamaican Dollars and have change where possible. To get relatively anywhere around Kingston it is Ja$100 per ride. To get outside of Kingston the fares range between Ja$300 and $1000 (US$3-10) depending on the distance.You can get local currency at the airport but the exchange rate is generally bad so just change enough to last you until you can get to a Cambio. There are also ATMs to withdraw local currency. 2) Do not travel with large quantities of cash or valuables. If you have to do so be as discreet as possible ,taking out only what you need to spend. The less money you flash around the less attention you will attract. 3) Always keep addresses, phone numbers and directions for your destination on hand. You can always ask locals for assistance as people are usually very helpful to foreigners and will even make a phone call for you where necessary if yo don’t have access to a cell phone. There are no public phones in Jamaica but most Jamaicans have a cellphone or two. If someone makes a phone call for you although it is not mandatory or always expected , it is courteous to offer to pay for the call. JA$100 is a reasonable reimbursement. 4) Do Not take Public Transportation after dark. As I mentioned above , it is more challenging to tackle a city in a strange country at night, so as a precautionary measure if going out at night or going to a destination that is unfamiliar to you arrange for a cab service. 5) Stick with legitimate public passenger vehicles where possible.-In Kingston I would recommend that foreigners take the JUTC buses as the service is the most organized. They have uniformed drivers , numbered buses and a ticketed system . The drivers are generally helpful and will assist you by leaving you at the stop closest to your destination . Route/shared taxis usually have red licence plates so try to stick to these where possible. There are numerous cab companies around Kingston and Montego Bay , you can search online for phone numbers and keep it handy in the event that you have difficulty getting to location. Though not as organized as the JUTC service in Kingston, all the major towns in Jamaica have a small transportation center or bus park with connecting bus services. It may require a few transfers to get to your destination so always try to plan your travel route as best as possible. In the rural areas , transportation is sometimes slow or nonexistent after dark hence I stress the importance of traveling in the day allowing yourself ample time to arrive at your destination. Getting around on public transportation in Jamaica can be a hassle , be prepared for bumpy rides, crowded vehicles and crazy drivers but if you want a peek into daily Jamaican life outside of the fancy resorts it is your best introduction. I hope that this post will be useful to you if you are considering traveling around Jamaica “the rough way”. Please feel free to leave your questions or concerns that you may have about traveling in Jamaica. I am also open to suggestions of a post that you would like to see about Jamaica. Happy Travels. I love this post! I was recently in Jamaica and like you said was told public transit would be way too risky. I love the idea of bus tourism. Last year we did a series of posts on fun places you could reach by bus in our hometown. It was well received so we have re-done it as a video series. If it is okay with you I would love to add a link to your post onto the landing page of that series (my website with /bus added to the end) as other places you can find adventure on the bus. Hi . Yes you can add a link to my post. I will check out your post as well, it does sound cool. I have been thinking to do some bus travels across Jamaica to places that I don’t know and see how far I can get on public transport. :). I probably should attempt an ebook or something about public transportation here because there is little to be found online. Thanks for your comment. Hello! I have just written you on CS asking for these tips and then I found your post. It’s very useful. Thank you so much!! Previous Previous post: Happy 51st Jamaica! Next Next post: 5 Spots You Should Visit in Jamaica.